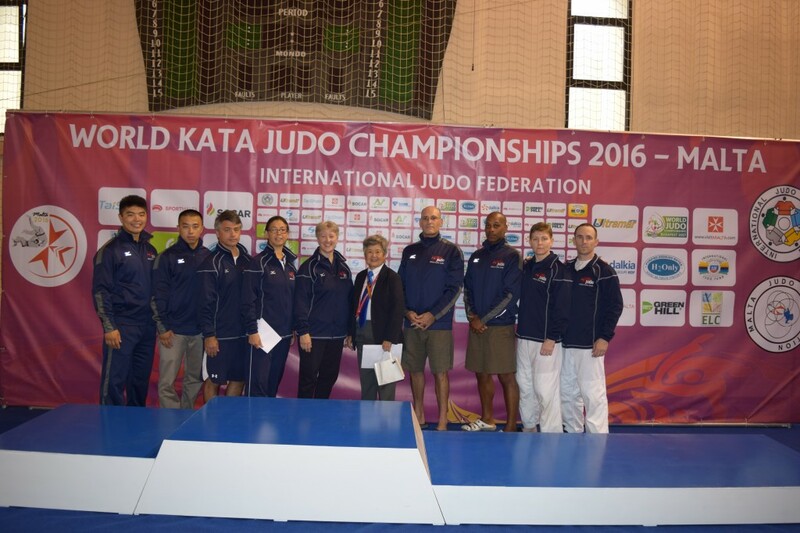 The World Kata Judo Championships returned to Malta this year. Eighty-eight pairs from over 20 countries competed in five katas. At Worlds this year, the competition was at the highest level we’ve seen and even slight imperfections were the difference between a medal or not. This year, in the Nage No Kata finals, three teams tied for second with 402 points each, and the next team had 401 points. According to IJF tie-breaking rules, two of these teams did not medal. In the other finals, medalists were separated by 2-3 points also. Japan won all Katas except Kime no kata (France) and Ju no kata (Germany, 2nd time gold medalist). The competition also keeps the judges at close reach of the IJF rules. Several teams received automatic deductions due to uniforms (Gi’s) not meeting regulation. For example, one player wore his practice gi, two players had incorrect back numbers, and one player had a non-regulation uniform. These slight and unfortunate infractions can make or break a medalist. But this is the World Championships, where competition is at its highest. At the World level competition, all teams (men, women and mixed) compete together. Competition is broken out into two brackets per kata with the top three teams in each bracket advancing to the finals. Each kata competition happens over one day with preliminaries in the morning and finals and medals in the afternoon; three katas on Day 1 and two on Day 2. This year, the USA had four teams at Worlds; three were from Shufu. 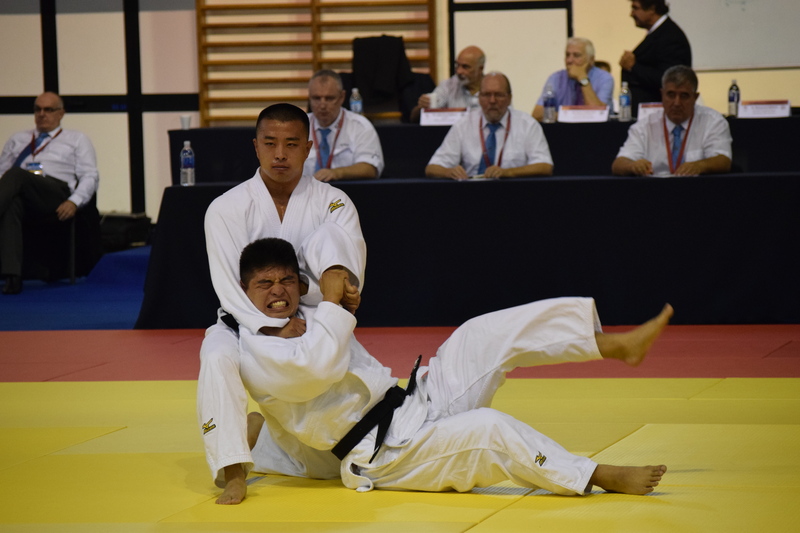 Wayne Lifshitz and Monty Rahmon Burton from National Institutes of Health and College Park judo clubs competed for the first time at Worlds in Kodokan Goshin Jutsu; they finished 15th. Karl Tamai and Diane Tamai Jackson from College Park Judo and Hui-O Judo competed for their fourth consecutive year. 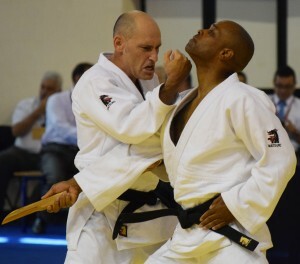 Competing in Ju No Kata (a switch from Nage No Kata) finished 12th. Robert Gouthro and Lisa Capriotti from Hui-o Judo competed for their third consecutive year. This was their second year to compete in Kime No Kata and finished 7th. Another first year team was Bryce Oishi and Chase Oishi, brothers from California, who competed in Katame No Kata; they finished 19th. The team was also represented by Kuniko Takeuchi sensei who was there as the Pan-American Judo Conference Kata committee chair, and Barb Houston-Shimizu as team manager and secretary for the PJC kata committee. The competition was followed by two days of kata seminar and practice led by the Kodokan senseis. The instruction was of course top-notch, the gold medal teams demonstrated their expertise in slow motion, and players were able to discuss fine points of technique execution during the practice sessions. For those of you who are kata judges, we need more of you at the judging table as judges are an integral part of the overall team. The USA is gaining knowledge and experience at the World level and are closer to reaching the Finals! Congratulations to all of the teams on their efforts.